Priyajyoti Nath Choudhury from Bangalore, B.Pharma Graduate. Priyajyoti Nath Choudhury is PG Diploma In Clinical Data Management,Graduated In BPharma and currently have no work experience. are one of expert skill area's of Priyajyoti Nath Choudhury . 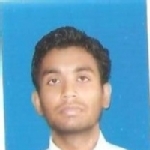 Priyajyoti Nath Choudhury is working in Bio Technology industry.